I have been trying to setup up a 4g usb modem with my raspberry pi running raspbian. The modem is recognized and I'm able to query imsi, signal strength and other details by running AT commands using minicom. Then I tried setting up wvdial. I tried to investigate the sequence of AT commands that windows sends by using a serial port sniffer. 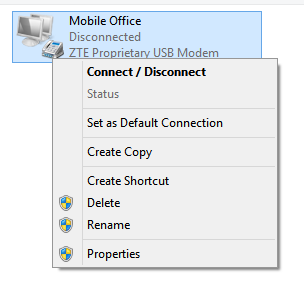 I connected my USB modem to my PC and started the dial up modem interface by right clicking on it and selecting connect. 01-18-2015 13:30:46.570 - Initializing modem. 01-18-2015 13:30:46.649 - Waiting for a call. 01-18-2015 13:30:46.664 - Initializing modem. 01-18-2015 13:30:46.789 - Connection established at 7200000bps. 01-18-2015 13:30:46.789 - Error-control off or unknown. 01-18-2015 13:30:46.789 - Data compression off or unknown. After that I tried to start the modem manually by running the AT commands from the log. I get an OK response for all commands until I hit ATDT*99# which gives CONNECT 100000000 and hangs. I don't understand, I used the same AT commands in the same order. It doesn't start when I run it manually, but it starts when I right click on the adapter select connect, which in turn runs the same AT commands. What is the extra thing that windows is doing on clicking connect? I couldn't make it work through wvdial, but I did manage to start the modem and connect to the internet using pppconfig to configure the ppp connection. I also ran into some issues with the dns settings which I resolved by using opendns ips. Not the answer you're looking for? Browse other questions tagged networking usb modem or ask your own question. Why does USB port enumeration change?